We cook. We eat. We laugh. We love eating quinoa. (藜麥…pronounce KIN-WA) We first discovered it in a small restaurant in Vancouver a few years back. The texture and the little pops in the mouth, plus the nutrients and protein it gives really is a one of a kind power grain. BUT before I begin mixing the salad, I have to start with a little story of why I had to make this very “summery” salad in January…..
My hubby and I both love to cook. Unfortunately our cooking styles tend to differ. He’ll think of what he wants to cook/eat the day of, go ahead and buy ingredients then dive right into the kitchen. Unfortunately, that leaves me, who hates to waste food, always having to check what’s leftover in the fridge (you’ll find half an onion from his cooking in the fridge ALWAYS). 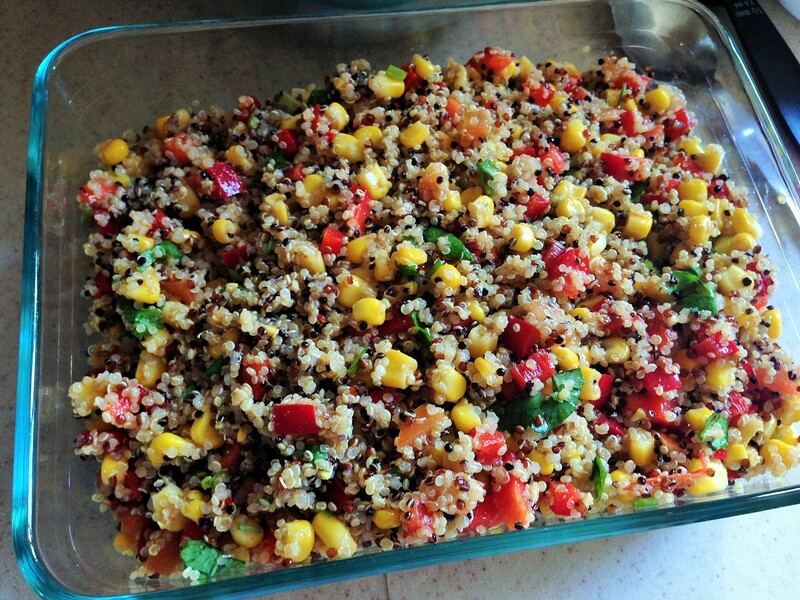 This Quinoa Salad is a GREAT way to use up leftover vegetables. You don’t have to follow my recipe to be exact, feel free to toss in some extra, or leave out whatever ingredients you don’t like! There’s also different types of quinoa: Plain Quinoa tends to have a smoother texture with mild nutty flavor, whilst the multi colored Quinoa (Black, red and plain) gives a stronger grain flavor with multiple textures. 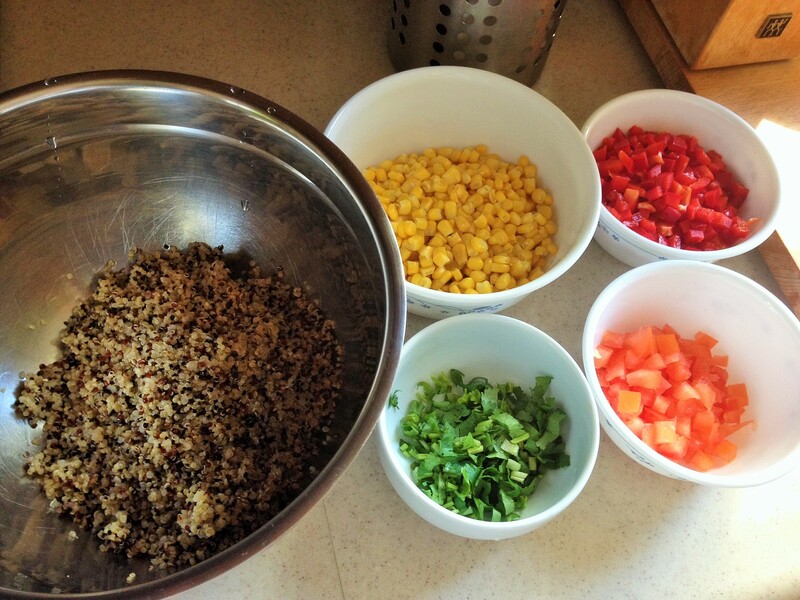 I used mixed Quinoas here because I love the variation in color, but I will use plain when I use it as a rice replacement during meals. So here I have my already cooked Quinoa, plus veggies of the day: corn, red pepper, parsley and tomato, all diced up and chopped to similar size. 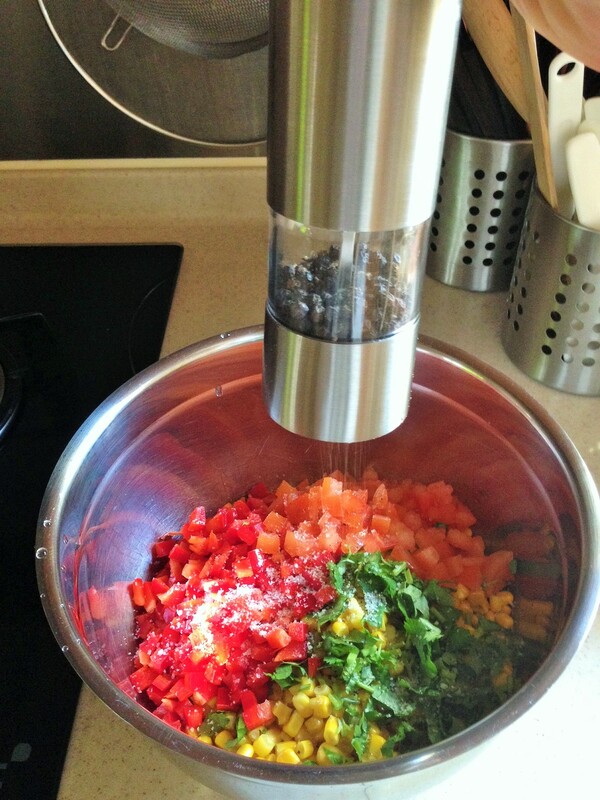 Add seasonings: salt, pepper, olive oil, lemon juice and cumin. Mix and adjust to taste. 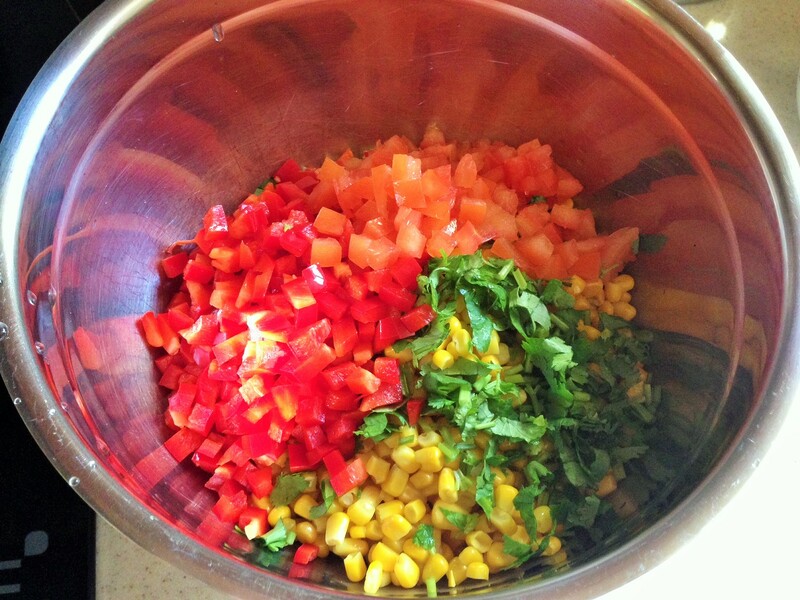 And here you have it, a wonderful, colorful vibrant mixed salad that is ready in minutes! !